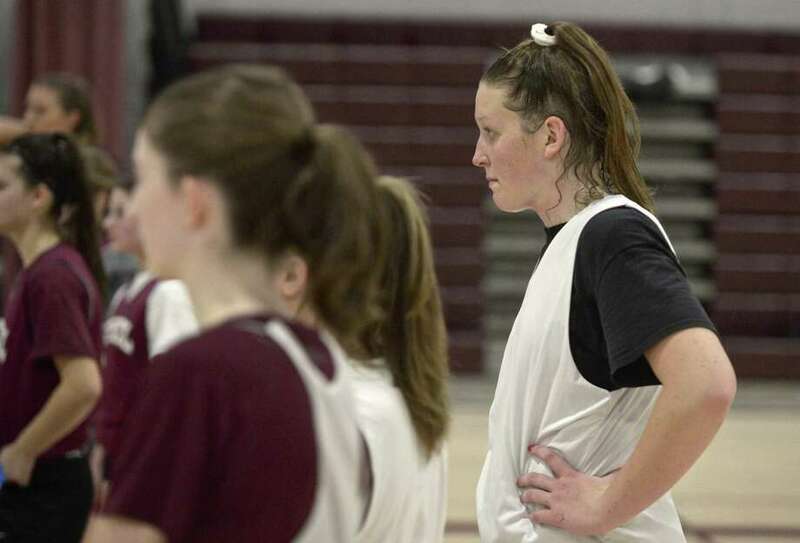 Bethel’s Maranda Nyborg watches the Bethel High School girls varsity practice Wednesday in Bethel. She found her feet as a freshman and exploded into an All-SWC first-teamer as a sophomore. The bad news for the rest of the conference is that her career is only halfway over. Bethel junior Maranda Nyborg will likely leave her mark in a big way over the next two seasons as the standout continues to improve her game. Last year the 6-foot-2 center averaged 18 points and 7.5 rebounds per game as Bethel went 19-5 and reached the SWC semifinals. Bethel coach Anderson Rawlins first saw Nyborg — who began playing the sport in second grade with several current Wildcats teammates — on a travel team in seventh grade and knew something special was there. The first workout in the gym confirmed these suspicions and they immediately began drawing out a plan for success. Nyborg made the varsity team as a freshman behind a very experienced group that produced one of the best seasons in school history. Last year belonged to Nyborg and graduated senior Abby Saunders, who combined to be an unstoppable force in the paint. A big junior campaign could be on the way for the seasoned Nyborg and the Wildcats. Leadership is the newest wrinkle Nyborg is adding to her repertoire, Rawlins said. She’s being recruited by several Division I schools in the Atlantic 10 and Big East. Nyborg plays for Connecticut Basketball Club and has dreams of playing at the highest level. The Wildcats have enjoyed outstanding success under Rawlins, including capturing the SWC title — a first for the school — in 2016-17. Bethel has also evolved into one of the most dangerous teams in Class M in that time and a state championship is on the list of goals for the group. Bethel had last season end in the Class M second round in heartbreaking fashion. The Wildcats led by 10 points midway through the fourth quarter against Sheehan before falling to a buzzer-beating shot as time expired. Bethel should be once again in the title hunt this year, though the cast will look different. Vicky Gracy, Mendonca, Anna Riolo, Tara Donohue and Natasha Redmond provide the experience, while freshmen Brooke Lacey and Ruby Ackerman will also contribute. Anyone who has played the Wildcats in Rawlins’ tenure knows a hard-working defense is the core identity. Rawlins noted this season his group could be more athletic than in years past, further opening the playbook.